It's another Fighting in The War Room Quarter Quell! This week, three segments, three movie reviews! The Ballad of Buster Scruggs is on Netflix, Fantastic Beasts 2: The Crimes of Grindelwald is in theaters now, and so is Widows, which is the much better movie! This week, Katey, Patches, and Da7e talk about The Good Place Season 3 (so far), David reveals he's been caring for a live hedgehog, and it's finally time to review A Star Is Born! 232 – Randy Rainbow, Maniac, What Do We Want From Superhero Performances? This week, all four hosts are back and IN THE COUNTRY! AND ON THE PODCAST! ALL FOUR! To Each Host, a Netflix Gift: A Reccommendation of a Foriegn Film From a Listener. 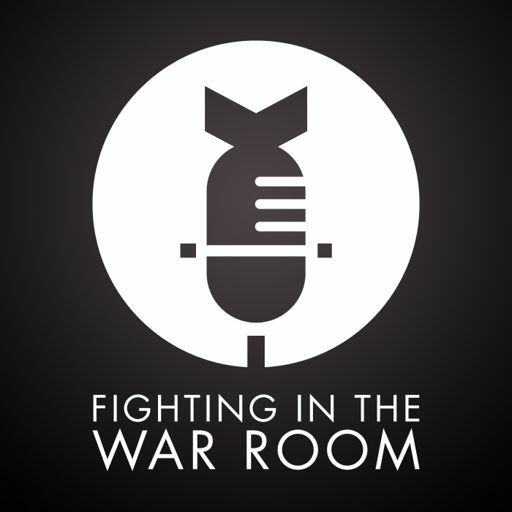 It's our EIGHTH Quell as Fighting in The War Room! 187 – American Vandal, Wonderstruck, AR in the Theater? 184 – Has Ryan Gosling Ever Been Good in a Movie? 182 – TIFF, Emmys, mother! This week, Patches is out and David goes missing, so Katey and Da7e talk about reading IT as children, and how Da7e is re-reading it now. Then, Da7e pitches Katey on the new Ducktales. It's a loose episode. Old friends, old arguments, new opinions, still good content. 177 – Dark Tower, Columbus, 2017 Summer In Review! 176 – Personal Shopper Revisited, Ready Player One Trailer, Dunkirk! 167 – TV Grab-Bag, Moogfest, and What Makes a Movie Good for Sequels? 163 – Is Netflix Burying Movies by Not Releasing Them in Theaters? 159 – Iron Fist, Baby Driver, Atomic Blond – and What’s Up With These Remakes/Reboots? It's only as political as it needs to be. With Guest Host David Sims from the Black Check Podcast! The Seventh Annual Top Ten Show (Part 2)! The Seventh Annual Top Ten Show! 146 – Fantastic Franchising and Awards Season Begins! Katey, David and Da7e review the wedding of their co-host in a special short episode. 133 – Amazon’s The Tick with Returning Guest Griffin Newman! 127 – When Franchise Filmmaking Goes…Wrong? When Pokémon Goes…Right? Plus HBO's Not-Game of Thrones "The Night Of"
With Special Guest Neil Miller! A movie was saw for the Horde.